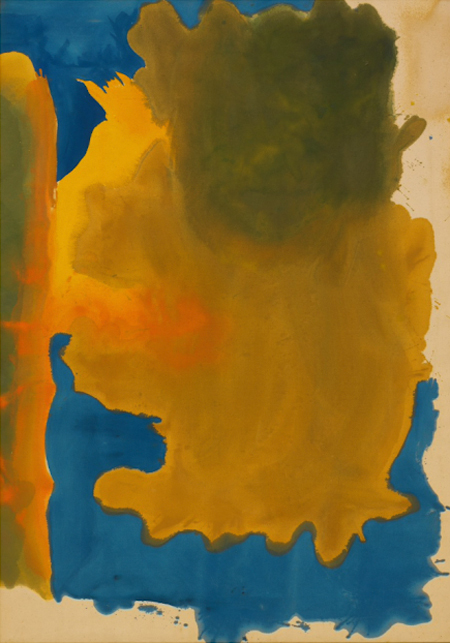 Unlike most of her contemporaries, Helen Frankenthaler did not need to join the Works Progress Administration, like scores of destitute artists. who were barely eking out a living. Growing up in an affluent family on New York City’s Upper East Side permitted her the opportunity to attend Bennington College, the prestigious liberal arts school in Vermont and upon graduation, go on to study with Hans Hofmann. She met Clement Greenberg in 1950 and had a close personal relationship with him that lasted five years, during which she was introduced to many other abstract expressionist artists like Robert Motherwell, who she married in 1958. They divorced in 1971 and in 1994 Frankenthaler married Stephen DuBrul. Over the decades, she painted and exhibited her work widely with other Color Field artists. Upon seeing the Jackson Pollock show at the Betty Parsons Gallery in 1950 where works like Lavender Mist were exhibited, she had this to say: “It was all there. I wanted to live in this land. I had to live there, and master the language” And master it she did. She developed her own technique where she painted onto unprimed canvas, with oil paints that were heavily diluted with turpentine, creating a liquefied, translucent effect. Of her own painting she said: “A really good picture looks as if it’s happened at once. It’s an immediate image. For my own work, when a picture looks labored and overworked, and you can read in it—well, she did this and then she did that, and then she did that—there is something in it that has not got to do with beautiful art to me. And I usually throw these out, though I think very often it takes ten of those over-labored efforts to produce one really beautiful wrist motion that is synchronized with your head and heart, and you have it, and therefore it looks as if it were born in a minute.” In 2001, she was awarded the National Medal of Arts. it is the highest honor specifically given for achievement in the arts conferred to an individual artist on behalf of the people.